Formed in March 2017, the Sanctuary and Immigrant Support Ministry is a collaborative team that includes members of our church’s justice and service groups (Community Service Ministry, Peace & Justice, Standing on the Side of Love, other interested members, and partners in the wider community). Building a relationship with and directly serving local immigrants and refugees. Leading a process within our congregation to gain status as a Sanctuary Church. Challenging racist, xenophobic, and Islamophobic attitudes and laws. "Be it resolved that we, the members of The Community Church of Chapel Hill, Unitarian Universalist, publicly declare our intent to be a Sanctuary Church. Before officially hosting someone in our space, we will seek to build a relationship with the sanctuary guest so that each party feels comfortable that this would be a fruitful and safe undertaking, respecting the needs and boundaries of both the individual and the congregation. Further, we dedicate ourselves to educate and activate our congregation and community, to amplify and respond to the voices of immigrant leaders, and to speak out against discrimination towards marginalized people. The Sanctuary and Immigrant Support Ministry, with and through the Minister, will provide periodic reports to the Board of Trustees regarding actions taken pursuant to this resolution." The Sanctuary Movement is a multi-faith movement to provide support and protection for immigrants in danger of deportation and to advocate for more just treatment of immigrant populations. For more information about sanctuary congregations, see the Unitarian Universalist Association page on the sanctuary movement. Local and national news stories about the Sanctuary Movement or other issues related to immigration can be found here. ​Answers to common questions about the practical considerations of offering sanctuary at Community Church of Chapel Hill can be found in the Practical Considerations document and the Top Five Questions document, and an overview of issues related to becoming a sanctuary church is available here. Questions for the Sanctuary and Immigrant Support Ministry team can be submitted here, and answers to previously asked questions can be viewed in the Sanctuary Questions google doc. ​If you would be willing to help provide support for a sanctuary guest, please fill out our volunteer form. You will have the option to indicate how you would like to help (staying with guest for a daytime or overnight shift, buying groceries, etc). Our congregation and Church of Reconciliation have promised mutual support should either of us have a guest in sanctuary. Since Church of Reconciliation has already accepted a sanctuary guest, we encourage you to volunteer with them. You may visit their volunteer sign-up sheet here. Click here to download a list of some of the tutoring and other volunteer opportunities with immigrants in our area. It includes contact information. Members volunteering as tutors in immigrant communities through the Chatham Literacy Council. A special “Bountiful Bags” food drive in June 2017 in response to a growing need expressed by the Interfaith Council for Social Services. Members volunteering as drivers for Syrian refugees to a picnic held in Carrboro in May 2017. Donating church space for a meeting of Movement to End Racism and Islamophobia (MERI). Sending members to The Gathering: Sanctuary and Immigration on August 6, 2017 led by Rev. William Barber and Repairers of the Breach. 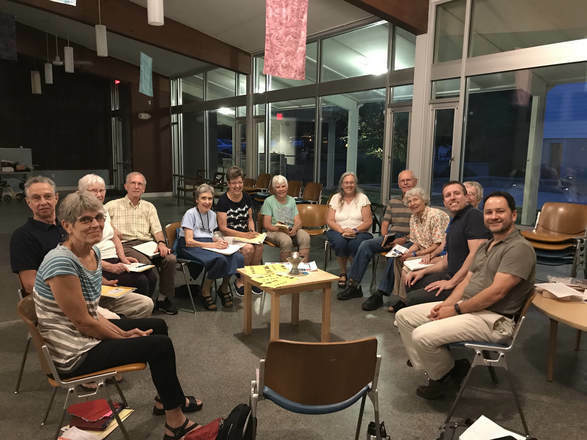 Establishing of a shared covenant with our neighboring UU congregations (Eno River UU Fellowship, UU Fellowship of Hillsborough, UU Fellowship of Raleigh, Mutual Aid Carrboro) to promise financial support, volunteer support, and moral support for Sanctuary efforts. Contacting local congregations and organizations to find out about opportunities for partnership and collaboration. Sending a team to the Sanctuary Matters: Testimony and Best Practices conference at United UCC on September 16, 2017.